Balmer Lawrie is the largest manufacturer of MS Drums in India and is the market leader in the industry with over 40% market share. The leadership position is further accentuated owing to the service orientation of our team and the geographical spread of our manufacturing facilities. Strategic Business Unit (SBU): Industrial Packaging (IP) manufactures MS Plain drums, Internally Coated drums, Composite drums, Tall drums, Necked-in drums, Conical drums, GI drums and Open Headed drums. We have 6 manufacturing units across the country including a state-of-the-art High Throughput Plant at Taloja, Navi Mumbai. 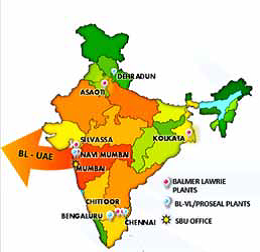 Our customer segments include PSU Oil, MNC Oil, Local Oil, Transformer Oil, Chemicals, Additives, Agrochemicals, Bitumen and Bitumen emulsion, Food & Fruit Pulp companies and Exports. The Technology & Product Development Centre located at Industrial Packaging, Kolkata plays a pivotal role in enabling quality up gradation, product innovation & diversification keeping pace with changing technology. We offer UN certified products and can also deliver drums confirming to BIS or specific customer specifications. We also undertake value chain services such as supply of drums, filling and transportation. We operate in the Semi-Bulk packaging industry and offer products such as the 156 / 200 / 210/250 liters capacity MS drums. Our technology tie-ups, advanced manufacturing, stringent quality control and distributed manufacturing infrastructure make us an attractive and convenient sourcing destination for a wide variety of packaging solutions.